Vonn has won four World Cup overall championships—one of only two female skiers to do so, along with Annemarie Moser-Pröll—with three consecutive titles in 2008, 2009, and 2010, plus another in 2012. Vonn won the gold medal in downhill at the 2010 Winter Olympics, the first one for an American woman. She has also won a record 8 World Cup season titles in the downhill discipline (2008–2013, 2015, 2016), 5 titles in super-G (2009–2012, 2015), and 3 consecutive titles in the combined (2010–2012). In 2016, she won her 20th World Cup crystal globe title, the overall record for men or women, surpassing Ingemar Stenmark of Sweden, who won 19 globes from 1975 to 1984. She has the second highest super ranking of all skiers, men or women. Vonn is one of 6 women to have won World Cup races in all five disciplines of alpine skiing—downhill, super-G, giant slalom, slalom and super combined—and has won 82 World Cup races in her career through February 3, 2018. Her total of 82 World Cup victories is a women's record, surpassing Annemarie Moser-Pröll of Austria who had held the record since the 1970s. Only Ingemar Stenmark of Sweden with 86 World Cup victories has more. 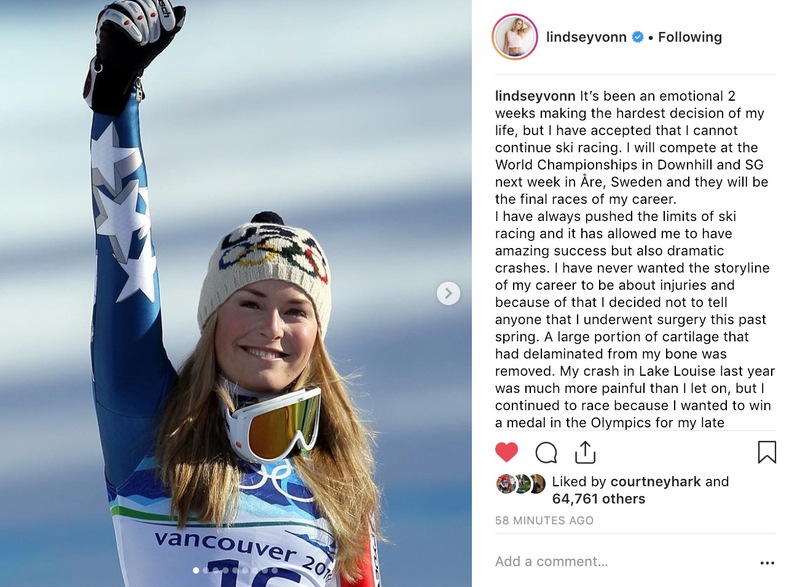 With her Olympic gold and bronze medals, 2 World Championship gold medals in 2009 (plus three silver medals in 2007 and 2011), and 4 overall World Cup titles, Vonn is the most successful American ski racer and one of the greatest of all skiers. In 2010, Vonn received the Laureus Sportswoman of the Year award and was the United States Olympic Committee's sportswoman of the year.